The polymerase chain reaction (PCR) is a biomedical technology in molecular biology used to amplify a single copy or a few copies of a piece of DNA across several orders of magnitude, generating thousands to millions of copies of a particular DNA sequence. The method relies on thermal cycling, consisting of cycles of repeated heating and cooling of the reaction for DNA melting and enzymatic replication of the DNA. Primers (short DNA fragments) containing sequences complementary to the target region along with a DNA polymerase, after which the method is named, are key components to enable selective and repeated amplification. As PCR progresses, the DNA generated is itself used as a template for replication, setting in motion a chain reaction in which the DNA template is exponentially amplified. PCR can be extensively modified to perform a wide array of genetic manipulations. Almost all PCR applications employ a heat-stable DNA polymerase, such as Taq polymerase (an enzyme originally isolated from the bacterium Thermus aquaticus). This DNA polymerase enzymatically assembles a new DNA strand from DNA building-blocks, the nucleotides, by using single-stranded DNA as a template and DNA oligonucleotides (also called DNA primers), which are required for initiation of DNA synthesis. The vast majority of PCR methods use thermal cycling, i.e., alternately heating and cooling the PCR sample through a defined series of temperature steps. In the first step, the two strands of the DNA double helix are physically separated at a high temperature in a process called DNA melting. In the second step, the temperature is lowered and the two DNA strands become templates for DNA polymerase to selectively amplify the target DNA. The selectivity of PCR results from the use of primers that are complementary to the DNA region targeted for amplification under specific thermal cycling conditions. PCR is used to amplify a specific region of a DNA strand (the DNA target). 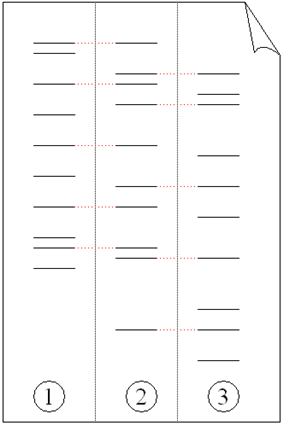 Most PCR methods typically amplify DNA fragments of between 0.1 and 10 kilo base pairs (kbp), although some techniques allow for amplification of fragments up to 40 kbp in size. The amount of amplified product is determined by the available substrates in the reaction, which become limiting as the reaction progresses. Typically, PCR consists of a series of 20-40 repeated temperature changes, called cycles, with each cycle commonly consisting of 2-3 discrete temperature steps, usually three (Figure below). The cycling is often preceded by a single temperature step at a high temperature (>90 °C), and followed by one hold at the end for final product extension or brief storage. The temperatures used and the length of time they are applied in each cycle depend on a variety of parameters. These include the enzyme used for DNA synthesis, the concentration of divalent ions and dNTPs in the reaction, and the melting temperature (Tm) of the primers. Initialization step(Only required for DNA polymerases that require heat activation by hot-start PCR. ): This step consists of heating the reaction to a temperature of 94–96 °C (or 98 °C if extremely thermostable polymerases are used), which is held for 1–9 minutes. Annealing step: The reaction temperature is lowered to 50–65 °C for 20–40 seconds allowing annealing of the primers to the single-stranded DNA template. This temperature needs to be low enough to allow for hybridization of the primer to the strand, but high enough in order for the hybridization to be specific, i.e. the primer should only bind to a perfectly complementary part of the template. If the temperature is too low, the primer could bind imperfectly. If it is too high, the primer might not bind. Typically the annealing temperature is about 3–5 °C below the Tm of the primers used. Stable DNA–DNA hydrogen bonds are only formed when the primer sequence very closely matches the template sequence. The polymerase binds to the primer-template hybrid and begins DNA formation. Final elongation: This single step is occasionally performed at a temperature of 70–74 °C (this is the temperature needed for optimal activity for most polymerases used in PCR) for 5–15 minutes after the last PCR cycle to ensure that any remaining single-stranded DNA is fully extended. PCR allows isolation of DNA fragments from genomic DNA by selective amplification of a specific region of DNA. This use of PCR augments many methods, such as generating hybridization probes for Southern or northern hybridization and DNA cloning, which require larger amounts of DNA, representing a specific DNA region. PCR supplies these techniques with high amounts of pure DNA, enabling analysis of DNA samples even from very small amounts of starting material. Other applications of PCR include E. coli) can be rapidly screened by PCR for correct DNA vector constructs. 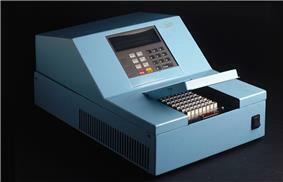 PCR may also be used for genetic fingerprinting; a forensic technique used to identify a person or organism by comparing experimental DNAs through different PCR-based methods. Some PCR 'fingerprints' methods have high discriminative power and can be used to identify genetic relationships between individuals, such as parent-child or between siblings, and are used in paternity testing (Fig. 4). This technique may also be used to determine evolutionary relationships among organisms. Because PCR amplifies the regions of DNA that it targets, PCR can be used to analyze extremely small amounts of sample. This is often critical for forensic analysis, when only a trace amount of DNA is available as evidence. PCR may also be used in the analysis of ADNA that is tens of thousands of years old. These PCR-based techniques have been successfully used on animals, such as a forty-thousand-year-old mammoth, and also on human DNA, in applications ranging from the analysis of Egyptian mummies to the identification of a Russian tsar and the body of English king Richard III. Quantitative PCR methods allow the estimation of the amount of a given sequence present in a sample—a technique often applied to quantitatively determine levels of gene expression. Quantitative PCR is an established tool for DNA quantification that measures the accumulation of DNA product after each round of PCR amplification. PCR permits early diagnosis of malignant diseases such as leukemia and lymphomas, which is currently the highest-developed in cancer research and is already being used routinely. PCR assays can be performed directly on genomic DNA samples to detect translocation-specific malignant cells at a sensitivity that is at least 10,000 fold higher than that of other methods. PCR allows for rapid and highly specific diagnosis of infectious diseases, including those caused by bacteria or viruses. PCR also permits identification of non-cultivatable or slow-growing microorganisms such as anaerobic bacteria, or viruses from tissue culture assays and animal models. The basis for PCR diagnostic applications in microbiology is the detection of infectious agents and the discrimination of non-pathogenic from pathogenic strains by virtue of specific genes. Viral DNA can likewise be detected by PCR. The primers used need to be specific to the targeted sequences in the DNA of a virus, and the PCR can be used for diagnostic analyses or DNA sequencing of the viral genome. The high sensitivity of PCR permits virus detection soon after infection and even before the onset of disease. Such early detection may give physicians a significant lead time in treatment. The amount of virus ("viral load") in a patient can also be quantified by PCR-based DNA quantitation techniques (see below). 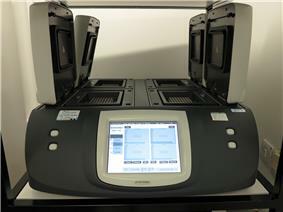 Digital PCR (dPCR): used to measure the quantity of a target DNA sequence in a DNA sample. The DNA sample is highly diluted so that after running many PCRs in parallel, some of them will not receive a single molecule of the target DNA. The target DNA concentration is calculated using the proportion of negative outcomes. Hence the name 'digital PCR'. Touchdown PCR (Step-down PCR): a variant of PCR that aims to reduce nonspecific background by gradually lowering the annealing temperature as PCR cycling progresses. The annealing temperature at the initial cycles is usually a few degrees (3-5 °C) above the Tm of the primers used, while at the later cycles, it is a few degrees (3-5 °C) below the primer Tm. The higher temperatures give greater specificity for primer binding, and the lower temperatures permit more efficient amplification from the specific products formed during the initial cycles. Universal Fast Walking: for genome walking and genetic fingerprinting using a more specific 'two-sided' PCR than conventional 'one-sided' approaches (using only one gene-specific primer and one general primer — which can lead to artefactual 'noise') by virtue of a mechanism involving lariat structure formation. Streamlined derivatives of UFW are LaNe RAGE (lariat-dependent nested PCR for rapid amplification of genomic DNA ends), 5'RACE LaNe and 3'RACE LaNe. Diagrammatic representation of an example primer pair. 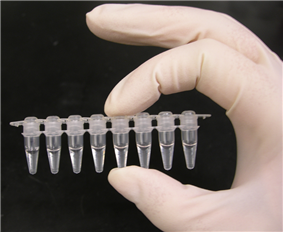 The use of primers in an in vitro assay to allow DNA synthesis was a major innovation which allowed the development of PCR. A 1971 paper in the Journal of Molecular Biology by Kleppe and co-workers first described a method using an enzymatic assay to replicate a short DNA template with primers in vitro. However, this early manifestation of the basic PCR principle did not receive much attention, and the invention of the polymerase chain reaction in 1983 is generally credited to Kary Mullis. When Mullis developed the PCR in 1983, he was working in Emeryville, California for Cetus Corporation, one of the first biotechnology companies. There, he was responsible for synthesizing short chains of DNA. Mullis has written that he conceived of PCR while cruising along the Pacific Coast Highway one night in his car. He was playing in his mind with a new way of analyzing changes (mutations) in DNA when he realized that he had instead invented a method of amplifying any DNA region through repeated cycles of duplication driven by DNA polymerase. In Scientific American, Mullis summarized the procedure: "Beginning with a single molecule of the genetic material DNA, the PCR can generate 100 billion similar molecules in an afternoon. The reaction is easy to execute. It requires no more than a test tube, a few simple reagents, and a source of heat." He was awarded the Nobel Prize in Chemistry in 1993 for his invention, seven years after he and his colleagues at Cetus first put his proposal to practice. However, some controversies have remained about the intellectual and practical contributions of other scientists to Mullis' work, and whether he had been the sole inventor of the PCR principle (see below). At the core of the PCR method is the use of a suitable DNA polymerase able to withstand the high temperatures of >90 °C (194 °F) required for separation of the two DNA strands in the DNA double helix after each replication cycle. The DNA polymerases initially employed for in vitro experiments presaging PCR were unable to withstand these high temperatures. So the early procedures for DNA replication were very inefficient and time consuming, and required large amounts of DNA polymerase and continuous handling throughout the process. The discovery in 1976 of Taq polymerase — a DNA polymerase purified from the thermophilic bacterium, Thermus aquaticus, which naturally lives in hot (50 to 80 °C (122 to 176 °F)) environments such as hot springs — paved the way for dramatic improvements of the PCR method. The DNA polymerase isolated from T. aquaticus is stable at high temperatures remaining active even after DNA denaturation, thus obviating the need to add new DNA polymerase after each cycle. This allowed an automated thermocycler-based process for DNA amplification. ^ Bartlett, J. M. S.; Stirling, D. (2003). "PCR Protocols" 226. pp. 3–6. ^ a b Saiki, R.; Scharf, S.; Faloona, F.; Mullis, K.; Horn, G.; Erlich, H.; Arnheim, N. (1985). "Enzymatic amplification of beta-globin genomic sequences and restriction site analysis for diagnosis of sickle cell anemia". Science 230 (4732): 1350–1354. ^ a b Saiki, R.; Gelfand, D.; Stoffel, S.; Scharf, S.; Higuchi, R.; Horn, G.; Mullis, K.; Erlich, H. (1988). "Primer-directed enzymatic amplification of DNA with a thermostable DNA polymerase". Science 239 (4839): 487–491. ^ Cheng, S.; Fockler, C.; Barnes, W. M.; Higuchi, R. (1994). "Effective Amplification of Long Targets from Cloned Inserts and Human Genomic DNA". Proceedings of the National Academy of Sciences 91 (12): 5695–5699. ^ Carr AC, Moore SD (2012). Lucia, Alejandro, ed. "Robust quantification of polymerase chain reactions using global fitting". PloS ONE 7 (5): e37640. ^ Pavlov, A. R.; Pavlova, N. V.; Kozyavkin, S. A.; Slesarev, A. I. (2004). "Recent developments in the optimization of thermostable DNA polymerases for efficient applications☆". Trends in Biotechnology 22 (5): 253–260. ^ Rychlik W, Spencer WJ, Rhoads RE (1990). "Optimization of the annealing temperature for DNA amplification in vitro". Nucl Acids Res 18 (21): 6409–6412. ^ a b Sharkey, D. J.; Scalice, E. R.; Christy, K. G.; Atwood, S. M.; Daiss, J. L. (1994). "Antibodies as Thermolabile Switches: High Temperature Triggering for the Polymerase Chain Reaction". Bio/Technology 12 (5): 506–509. ^ a b Chien A, Edgar DB, Trela JM (1976). "Deoxyribonucleic acid polymerase from the extreme thermophile Thermus aquaticus". J. Bacteriol 127 (3): 1550–1557. ^ a b Lawyer, F.; Stoffel, S.; Saiki, R.; Chang, S.; Landre, P.; Abramson, R.; Gelfand, D. (1993). "High-level expression, purification, and enzymatic characterization of full-length Thermus aquaticus DNA polymerase and a truncated form deficient in 5' to 3' exonuclease activity". PCR methods and applications 2 (4): 275–287. ^ PCR from problematic templates. Focus 22:1 p.10 (2000). ^ Helpful tips for PCR. Focus 22:1 p.12 (2000). ^ Sarkar, G.; Kapelner, S.; Sommer, S. (1990). "Formamide can dramatically improve the specificity of PCR". Nucleic Acids Research 18 (24): 7465. ^ Pavlov AR, Pavlova NV, Kozyavkin SA, Slesarev AI (2006). "Thermostable DNA Polymerases for a Wide Spectrum of Applications: Comparison of a Robust Hybrid TopoTaq to other enzymes". In Kieleczawa J. DNA Sequencing II: Optimizing Preparation and Cleanup. Jones and Bartlett. pp. 241–257. ^ "Chemical Synthesis, Sequencing, and Amplification of DNA (class notes on MBB/BIO 343)". Arizona State University. Retrieved 2007-10-29. ^ a b c Cai, H; Caswell JL; Prescott JF (March 2014). "Nonculture Molecular Techniques for Diagnosis of Bacterial Disease in Animals: A Diagnostic Laboratory Perspective". Veterinary Pathology 51 (2): 341–350. ^ Salis AD (2009). "Applications in Clinical Microbiology". 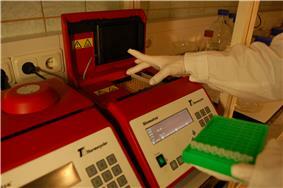 Real-Time PCR: Current Technology and Applications. Caister Academic Press. ^ Newton CR, Graham A, Heptinstall LE, Powell SJ, Summers C, Kalsheker N, Smith JC, and Markham AF (1989). "Analysis of any point mutation in DNA. The amplification refractory mutation system (ARMS)". Nucleic Acids Research 17 (7): 2503–2516. ^ Stemmer WP, Crameri A, Ha KD, Brennan TM, Heyneker HL (1995). "Single-step assembly of a gene and entire plasmid from large numbers of oligodeoxyribonucleotides". Gene 164 (1): 49–53. ^ Innis MA, Myambo KB, Gelfand DH, Brow MA. (1988). "DNA sequencing with Thermus aquaticus DNA polymerase and direct sequencing of polymerase chain reaction-amplified DNA". Proc Natl Acad Sci USA 85 (24): 9436–4940. ^ Pierce KE and Wangh LJ (2007). "Linear-after-the-exponential polymerase chain reaction and allied technologies Real-time detection strategies for rapid, reliable diagnosis from single cells". Methods Mol Med. Methods in Molecular Medicine™ 132: 65–85. ^ Schwartz JJ, Lee C, Shendure J. (2012). "Accurate gene synthesis with tag-directed retrieval of sequence-verified DNA molecules". Nature Methods 9 (9): 913–915. ^ Vincent,Myriam, Xu, Yan, and Kong, Huimin (2004). "Helicase-dependent isothermal DNA amplification". EMBO Reports 5 (8): 795–800. ^ Q. Chou, M. Russell, D.E. Birch, J. Raymond and W. Bloch (1992). "Prevention of pre-PCR mis-priming and primer dimerization improves low-copy-number amplifications". Nucleic Acids Research 20 (7): 1717–1723. ^ Kellogg D E, Rybalkin I, Chen S, Mukhamedova N, Vlasik T, Siebert P D, Chenchik A. 1994. TaqStart Antibody: hot start PCR facilitated by a neutralizing monoclonal antibody directed against Taq DNA polymerase. BioTechniques 16 (6):1134-1137Kellogg, DE; Rybalkin, I; Chen, S; Mukhamedova, N; Vlasik, T; Siebert, PD; Chenchik, A (1994). "TaqStart Antibody: "hot start" PCR facilitated by a neutralizing monoclonal antibody directed against Taq DNA polymerase". BioTechniques 16 (6): 1134–7. ^ San Millan RM, Martinez-Ballesteros I, Rementeria A, Garaizar J, Bikandi J (2013). "Online exercise for the design and simulation of PCR and PCR-RFLP experiments". BMC Research Notes 6: 513. ^ E. Zietkiewicz, A. Rafalski, and D. Labuda (1994). "Genome fingerprinting by simple sequence repeat (SSR)-anchored polymerase chain reaction amplification". Genomics 20 (2): 176–83. ^ Ochman H, Gerber AS, Hartl DL (1988). "Genetic Applications of an Inverse Polymerase Chain Reaction". Genetics 120 (3): 621–623. ^ Mueller PR, Wold B (1988). "In vivo footprinting of a muscle specific enhancer by ligation mediated PCR". Science 246 (4931): 780–786. ^ Herman JG, Graff JR, Myöhänen S, Nelkin BD, Baylin SB (1996). "Methylation-specific PCR: a novel PCR assay for methylation status of CpG islands". Proc Natl Acad Sci USA 93 (13): 9821–9826. ^ Isenbarger TA, Finney M, Ríos-Velázquez C, Handelsman J, Ruvkun G (2008). "Miniprimer PCR, a New Lens for Viewing the Microbial World". Applied and Environmental Microbiology 74 (3): 840–9. ^ Cenchao Shen, Wenjuan Yang, Qiaoli Ji, Hisaji Maki, Anjie Dong, Zhizhou Zhang (2009). "NanoPCR observation: different levels of DNA replication fidelity in nanoparticle-enhanced polymerase chain reactions". Nanotechnology 20: 455103. ^ Horton RM, Hunt HD, Ho SN, Pullen JK, Pease LR (1989). "Engineering hybrid genes without the use of restriction enzymes: gene splicing by overlap exten-sion". Gene 77 (1): 61–68. ^ David, F. and Turlotte, E., (1998). "An Isothermal Amplification Method". C.R.Acad. Sci Paris, Life Science 321 (1): 909–914. ^ Bing, D. H., C. Boles, F. N. Rehman, M. Audeh, M. Belmarsh, B. Kelley, and C. P. Adams. (1996). "Bridge amplification: a solid phase PCR system for the amplification and detection of allelic differences in single copy genes". Genetic Identity Conference Proceedings, Seventh International Symposium on Human Identification. ^ Khan Z, Poetter K, Park DJ (2008). "Enhanced solid phase PCR: mechanisms to increase priming by solid support primers". Analytical Biochemistry 375 (2): 391–393. ^ Raoult, D; G Aboudharam; E Crubezy; G Larrouy; B Ludes; M Drancourt (2000-11-07). "Molecular identification by "suicide PCR" of Yersinia pestis as the agent of medieval black death". Proc. Natl. Acad. Sci. U.S.A. 97 (23): 12800–12803. ^ Y.G. Liu and R. F. Whittier (1995). "Thermal asymmetric interlaced PCR: automatable amplification and sequencing of insert end fragments from P1 and YAC clones for chromosome walking". Genomics 25 (3): 674–81. ^ Don RH, Cox PT, Wainwright BJ, Baker K, Mattick JS (1991). Touchdown' PCR to circumvent spurious priming during gene amplification"'". Nucl Acids Res 19 (14): 4008. ^ Myrick KV, Gelbart WM (2002). "Universal Fast Walking for direct and versatile determination of flanking sequence". Gene 284 (1–2): 125–131. ^ Park DJ (2005). "A new 5' terminal murine GAPDH exon identified using 5'RACE LaNe". Molecular Biotechnology 29 (1): 39–46. ^ Park DJ (2004). "3'RACE LaNe: a simple and rapid fully nested PCR method to determine 3'-terminal cDNA sequence". Biotechniques 36 (4): 586–588, 590. ^ Kleppe K, Ohtsuka E, Kleppe R, Molineux I, Khorana HG (1971). "Studies on polynucleotides. XCVI. Repair replications of short synthetic DNA's as catalyzed by DNA polymerases". J. Mol. Biol. 56 (2): 341–361. ^ Mullis, Kary (1990). "The unusual origin of the polymerase chain reaction". Scientific American 262 (4): 56–61, 64–5. ^ Advice on How to Survive the Taq Wars ¶2: GEN Genetic Engineering News Biobusiness Channel: Article. May 1, 2006 (Vol. 26, No. 9).